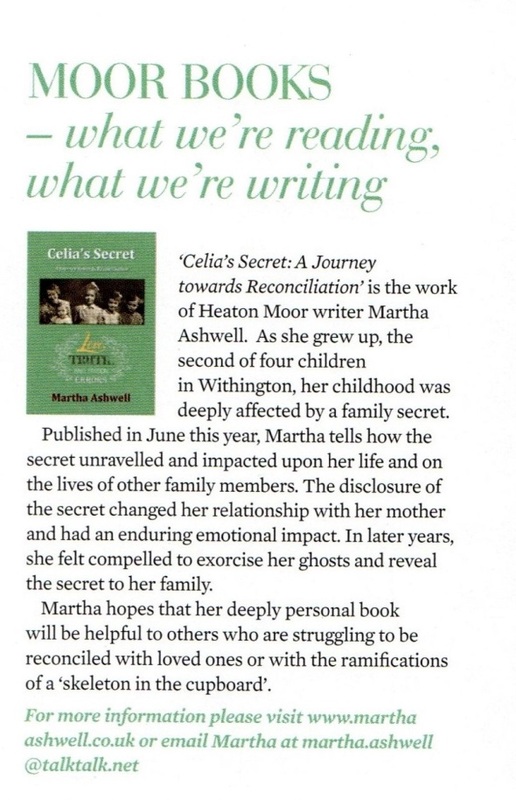 ‘Celia’s Secret: A Journey towards Reconciliation’ is the work of Heaton Moor writer Martha Ashwell. As she grew up, the second of four children in Withington, her childhood was deeply affected by a family secret. 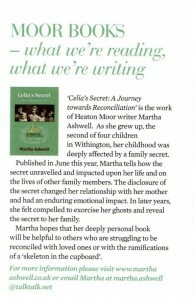 Published in June this year, Martha tells how the secret unravelled and impacted upon her life and on the lives of other family members. The disclosure of the secret changed her relationship with her mother and had an enduring emotional impact. In later years, she felt compelled to exorcize her ghosts and reveal the secret to her family. Martha hopes that her deeply personal book will be helpful to others who are struggling to be reconciled with loved ones or with the ramifications of a ‘skeleton in the cupboard’.